This guide is a candidate for being featured. A featured guide should be complete in every sense and serve as an example for other guides. Please voice your opinion on this guide. This is the first game in the Simon the Sorcerer series. 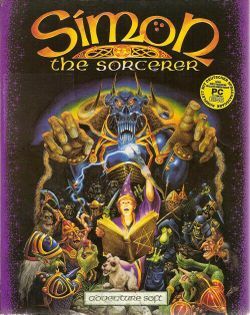 For other games in the series see the Simon the Sorcerer category. Simon the Sorcerer is an adventure game that was released by Adventure Soft on January 2, 1993 for Amiga and MS-DOS formats. The game includes parodies of various popular books and fairy tales, including Rapunzel, The Lord of the Rings, The Chronicles of Narnia, Jack and the Beanstalk and the Three Billy Goats Gruff. Simon is voiced in this game by Chris Barrie, known for his roles in Red Dwarf and The Brittas Empire. The story begins with the protagonist, Simon, as an ordinary teenager. His dog, "Chippy", discovers a chest in the loft of his house containing a spellbook titled "Ye Olde Spellbooke" (which Simon derisively reads as "Ye old-ee spellbook-ee") . Simon throws the book onto the floor in contempt, but a portal opens above it. Chippy goes through the portal and Simon follows. This page was last edited on 10 July 2016, at 03:43.